The South College School of Business & Technology has earned accreditation candidate status from the International Accreditation Council for Business Education (IACBE), which determined that the college’s business programs are eligible for review. South College, a private institution regionally accredited by the Southern Association of Colleges and Schools Commission on Colleges, will pursue IACBE accreditation for the accounting and business administration programs offered at the associate, bachelor’s and master’s levels. The IACBE provides a process by which institutions of higher education can earn accreditation for business programs. Accreditation is granted by an independent, external evaluation of the quality, effectiveness and outcomes of a school’s programs. South College was officially awarded candidate status in mid-February based on approval from IACBE’s board of commissioners. The school has up to five years to secure program accreditation by meeting all IACBE requirements. 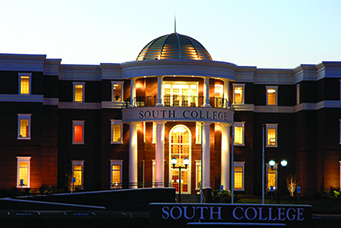 South College offers business programs online and at its campuses in Knoxville and Nashville in Tennessee, and Asheville, North Carolina. South College is a private institution regionally accredited by the Southern Association of Colleges and Schools Commission on Colleges (SACSCOC) to offer programs at the doctorate, educational specialist, master’s, baccalaureate and associate levels. For more information about South College retention/graduation rates, the median loan debts of students who complete the program and other important information, please visit south.edu.